Currently, I am a third year pediatric critical care fellow at the University of Texas Health Science Center (UTHSCSA). I want to take this time and thank The Benjamin H. Josephson, MD fund for supporting my passion in global health and giving me the opportunity to travel with the organization, "For Hearts and Souls" where our mission is to "Search & Heal the Broken Hearts." This is the tenth year that the team has been invited by the Minister of Health to provide clinical and educational resources to a core group of practioners in Mongolia. Our mission entailed traveling to Dorongov, southern province of Mongolia bordering with China. We provided screenings for children at hospitals and schools in Zamyn-Uud and Sainshund. Screening consisted of heart auscultation and evaluation of pulses. If abnormal findings were found, the patient was then evaluated by echocardiogram. Fifty children were identified with congenital heart disease out of 2400 children who were screened. These kids were set up for a diagnostic evaluation, surgical intervention or some type of local follow-up. We then traveled to Shastin Third Hospital in the capital city of Ulaanbaatar. 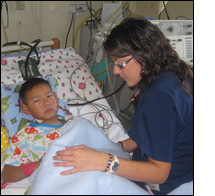 Shastin Hospital is the only hospital providing cardiac surgery in Mongolia. We organized donated medical supplies and coordinated equipment and supplies with that available at the hospital. We performed 19 diagnostic and interventional catheterizations and 10 open-heart surgeries. My role in the inpatient setting was that of a pediatric critical care intensivist managing the patients post-operatively. I was responsible for all aspects of post-op care. Post-operative complications included dysrhythmias and gastroenteritis with dehydration, electrolyte abnormalities and seizures. These complications were treated and resolved prior to the team's departure. Furthermore, I assisted the pediatric anesthesiologist during and after the OR cases. The surgical cases included the repair of: 7 ventricular septal defects, (VSD), 1 mitral valve, 1 double chamber Right Ventricle, 1 atrial septal defect, and 1 VSD with ruptured Sinus of Valsalva. The resources available are significantly limited compared to my practice in fellowship in the United States. Labs, blood typing and availability, and imaging are limited and labor intensive. I learned to maintain excellent care and outcomes relying on sole clinical skills. And, I learned how fortunate and spoiled we are by living in the United States as we have unlimited access to healthcare, technology, medications, and sub-specialty services. Thank you for allowing me to venture on this medical mission where children in Mongolia are now able to live fuller lives.